Mountain Retreat! Kids' Tennis camp, Tennis clinics, hiking, mountain biking. 2 bed 2 full bath mountain views! Country mountain, fresh air summer getaway. This is a newly renovated, top floor property with a layout meant for entertaining and a gorgeous view of Stratton. The kitchen overlooks the dining/living room area which features a warm wood burning fireplace and fantastic views. There are portable air conditioning units to keep you cool or you can open the windows and let the fresh mountain air in. The kitchen is fully stocked with all you will need to cook a meal. The two bedrooms sleep up to 6 people comfortably, ideally 4 adults and two children. The first bedroom features a queen bed and twin bunks (meant for children) and the second bedroom features a king bed. Both bedrooms have their own full bathroom with tub and shower. There is a large entry way/mud room where you can hang towels, kick off your hiking/riding boots or unload your water sports gear as you start to unwind after a long summer day of adventuring. There is also an outdoor balcony with a beautiful view of Stratton where you can enjoy your morning coffee or evening wine. Conveniently located on the first floor, you will find a private closet "locker" where you can store all of your gear which makes it very easy to grab your gear in the morning and go! There are tennis rackets provided to take with you to the courts which are a very short walk away. TV with cable and DVD player (with DVD Collection) is located in the living room and another TV with cable and a video game console is located in the bunk room. A small old school boom box is located in the living room. It has a CD player, an AUX plug where you can plug in your phone, and a radio where you can listen to our local alternative station WEQX. WiFi throughout. This is a perfect property for the Vermont Summer Festival's Horse enthusiasts or anybody who wants an outdoor adventure. The condo is located directly next to the fitness center which features a pool, sauna, indoor and outdoor tennis, yoga, full gym, and complimentary coffee and tea. For an extra daily or per class fee you can enjoy all the amenities there. There are tennis instructors on hand to book private or semi private lessons. The Fitness center has a small pro shop and sells some snacks as well. All summer long there are week long kids' tennis camps which run from 9:00-3:00. 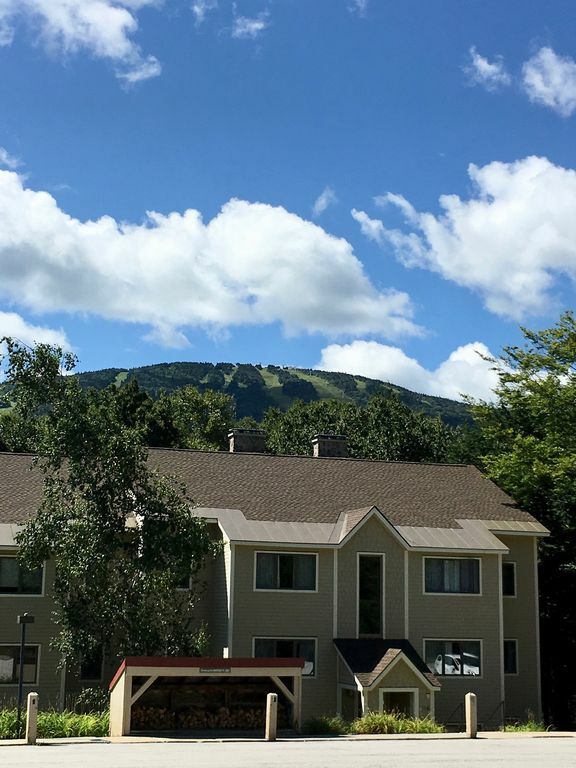 That leaves the adults free to either play their own tennis or go hiking, biking, kayaking or any number of other outdoor activities the Stratton area has to offer. Other nearby attractions include The Stratton Snowmaking pond! Bring your cooler, lunch, swim gear, and something to float around on. Enjoy swimming and socializing with other summer revelers in a beautiful, natural setting. Bromley ski area, (17 minute drive) With it's Summer Adventure park and alpine slide (and if you hike to the top you get to take the alpine slide down for free) Mt. Snow ski area for hiking (14 minute drive) and Manchester Village (26 minute drive) where you will find many restaurants and shopping opportunities. There is also a movie theater in Manchester along with museums and art galleries. Manchester is known for it's outlet shopping so this can be nice for a day you do not plan to venture out in the rain. There are also various rural farms worth visiting and other quaint small Vermont towns nearby. The Weston Playhouse in Weston VT is famous for the Vermont Country Store and The Weston Playhouse, an equity theater company which brings talent up from Broadway! The Appalachian Trail and The Long Trail pass through Stratton. You can pick up the Catamount trail about a 15 minute drive from Stratton. Also a short drive, in Peru, VT (where the 80s movie "Baby Boom" was filmed) you will find Wild Wings which offers yoga in a beautiful country setting. Venture to Rawsonville (10 minute drive) and hit up Fran's kitchen (food is great!) or Honeypie which has the best milkshakes ever. There is also a coffee shop and a beer shop, a convenience store, and several sporting goods shops. The village of Stratton has several very good restaurants, shopping, and a general store. Stratton also holds many music events and activities on the mountain in the summer. Hiking to the top of Stratton is breathtaking and when you hike up you get to take the gondola down for free! Just a short, 5 minute ride away in the town of Bondville is a larger general store, several sport shops, a pub, a pizza place, and a 7-Eleven where you can purchase gas, wine, beer, and spirits. There are mountain bike/kayak rentals available in Bondville and in Stratton Village. Bondville has a free music festival every Friday night in the summer which is great fun for the whole family. Come and enjoy this beautiful, adventure filled, fresh air get away! I moved from Los Angeles to Vermont to enjoy a different way of life. I love all that Vermont has to offer and I'm sure you will too! It has always been my dream to own a vacation rental property and I have lovingly prepared it for your stay. Welcome! I love the mountains and the skiing. I also love this area in the spring summer and fall. There is never a dull moment when you are out in nature. I also love cozy surroundings and I have created that for your stay. Horse show, tennis, golf, hiking, mountain biking, swimming, nature! We have filters and coffee on hand at the start of your stay. Should last the duration. Most everything you need to cook and serve a complete meal for 6.
stairs to top floor condo unit. Indoor pool available for a day fee at the fitness center located right next to Vantage Point. One of the best ski condos I've stayed in! Clean, well-cared for, beautifully appointed and decorated, fully stocked and....lot's of hooks to dry your stuff after a day of skiing/riding! In addition to the fine accommodations, I was very appreciative of the rapid response in helping resolve a small glitch in the internet service. Thanks so much for everything!! We loved our stay. The condo was clean, comfortable and nicely decorated. The kitchen has everything you need! The mountain shuttle stopping right outside the building was amazing. More than enough room for our family of 5. Thank you! Loved everything about this property!! It was so comfortable to come back to after long days of skiing/snowboarding. Well-appointed, remarkably clean and super cozy with lots of warm, soft luxurious pillows and blankets. And can’t beat the location or the view!! I only wish we could’ve stayed longer. Great job Kristin! The perfect place to stay for our ski trip! The condo was so comfy and well equipped. Kristin provided everything you will need, even a cute teddy bear in case your little one forgets their favorite stuffed animal! Beds are comfortable, nice linens and towels and condo is very clean. The little extras are a wonderful touch ... coffee, tea, pancake mix, condiments, microwave popcorn, even pasta and sauce! We brought our own but nice to know it was there if we wanted it. Would definitely stay here again and highly recommend it! This property is located right next to the Stratton Fitness center and can be reached by a short walk or drive. For a daily fee or a class fee you can enjoy swimming, tennis, yoga, pilates, strength training, or cardio activity. We can provide babysitting services for your young ones while you ski or go out for an evening. If we know in advance we can make arrangements.